BERLIN | BRUSSELS | PARIS (IDN) - The UN Climate Change Conference (COP21) in Paris would be recorded in the annals of global negotiations if only because a block of wealthy nations responsible for contributing to global warming made a common cause with a group of developing nations suffering the dire consequences of climate change. As the conference inched towards a close, the 28-nation European Union joined the group of 79 African, Caribbean and Pacific (ACP) States to push for an "ambitious, durable and legally binding" deal with a strong review every five years. This landmark initiative was preceded by consultations within the ACP Group ahead of COP21. The ACP regions hosted a number of meetings at the highest political level as well as among the climate negotiators and NGOs, to coordinate positions for the various agenda items that were on the table in Paris. These meetings included: the 15th Session of the African Ministerial Conference on the Environment held in Cairo (March 4-6); the Conference of Heads of Government of the Caribbean Community (CARICOM) in Barbados (July 2-4); the Third Summit of the Pacific Island Development Forum (September 2-4) and the Preparatory Meeting of the African Heads of State and Government on Climate Change (CAHOSCC) on September 25, 2015 in New York on the margins of the 70th Session of the United Nations General Assembly (UNGA-70). According to the ACP Issues Paper on the Paris Climate Change Conference (COP 21) endorsed on November 18, 2015, inputs also came from the Regional Forum for Civil Society and Pan-African Members of Parliament in Libreville on July 21- 22, 2015; the Libreville Ministerial Declaration of Economic Community of Central African States of August 27, 2015 and the Pacific Islands Forum Leaders Declaration on Climate Change Action in Port Moresby on September 2015. The ACP Group also held regional dialogues ahead of COP21, including Africa Climate Talks in Dar es Salaam, Tanzania (September 3-5) and the preparatory meeting for COP21 of Caribbean Community (CARICOM) climate change negotiators and Ministers with responsibility for climate change in Castries, St. Lucia (September 16-18). Further inputs came from the preparatory meetings of the Pacific region including the 26th Meeting of Officials of the Pacific Island Member Countries, organised by the Secretariat of the Pacific Regional Environment Programme (SPREP) in Apia, Samoa (September 22-24), and the extraordinary meeting of the Economic Community of Central African States and the Fifth Conference on Climate Change and Development in Africa (CCDA V) in Victoria Falls, Zimbabwe, from October 28 to 30. At the ACP level, a Regional Joint Policy Discussion was held in Addis Ababa, Ethiopia, on June 30 and July 1, 2015, which also contributed elements for the development of a common position of the ACP Group on the Paris Climate Change Conference. Addressing the COP21 high-level segment, Dr Patrick Gomes, the Secretary-General of the ACP Group of States, said on December 8 that the adverse impacts of climate change presented the single greatest challenge not only to the sustainable livelihoods, security and well-being of the peoples of the ACP Group of States, but also to “the very survival” of the countries of the Group. He urged the conference to agree on reducing greenhouse gas emissions to ensure a global temperature of 1.5 degrees Celsius above pre-industrial levels, while underlining the need for a review every five years of the implementation of the Paris Agreement, once finalised. He stressed that a robust transparency and accountability system, in addition to adequate, predictable, and sustainable climate financing, is also essential for ACP countries. Adapting to climate change was a high priority for all ACP Countries, and especially those that are particularly vulnerable, including the Small Island Developing States (SIDS), the Least Developed Countries (LDCs) and African countries. 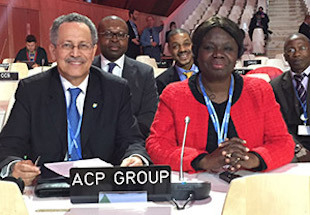 The ACP Group includes 48 developing countries in Africa, 16 in the Caribbean and 15 in the Pacific region. The fight against climate change, he added, must be tackled in an urgent, cohesive and decisive manner at the international, regional and national levels, collectively by both developed and developing countries, taking into consideration the principle of common but differentiated responsibilities and respective capabilities. While announcing the joint initiative, EU Climate Action and Energy Commissioner Miguel Arias Cañete, Minister for Environment of Luxembourg holding the Presidency of the Council of the European Union, Carole Dieschbourg, and ACP Secretary-General Gomes, highlighted the longstanding cooperation and common understanding between the two groups of countries in the fight against climate change. Miguel Arias Cañete and Gomes welcomed the signing of the 11th European Development Fund Intra-ACP Strategy by the ACP Group and the European Commission on November 26, which allocates €475 million (nearly $522) to be dedicated to climate change, resilience building and the environment up to 2020.